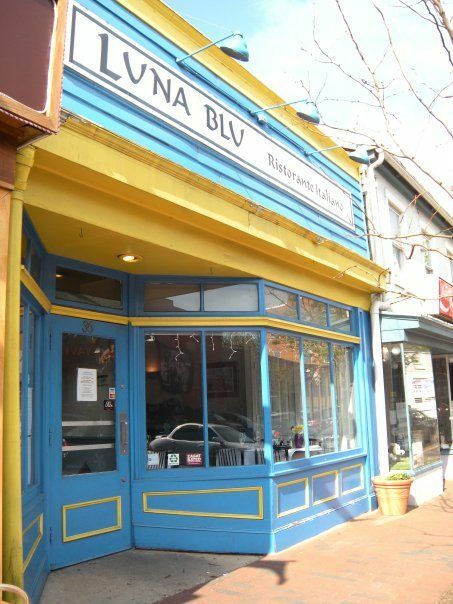 Luna Blu is an intimate Italian Restaurant located in the Historic District of downtown Annapolis, Maryland, on the new "hot spot" addition of West Street. We offer authentic Italian cuisine in a cozy atmosphere and our friendly staff assures an excellent dining experience. Our decor is warm, with hand painted murals depicting Naples. Candles and blue glass accents decorate the restaurant. Fresh cut flowers line the columned archways and walls. We offer daily specials in addition to our 4-Course dinner special offered nightly for only $35.00. Our Dinner Menu includes a broad selection of Appetizers, Salads, Pasta Dishes and Entrees. Our sauces are made daily and we use only the freshest ingredients to personally prepare all Entrees by order. All of our Desserts are made in-house including our house specialty Zabaglione. Luna Blu also offers half price bottle of Wine every Monday & Wednesday, excluding Super Tuscans. Ask us about our different Catering options available to meet your event or personal need: Our On-Site Catering Events are held in our dining room, which seats up to 54 people for a sit down meal and 45 for a buffet. We have added some great new additions, on top of our existing Italian offerings to our Off-Site Catering Events. We have taken our in house Lunch Menu, with a few additions, and structured it for any gathering with our Off Site Party Platters (Delivery or Pick up). We take great pride in our restaurant and in your satisfaction. We strive to create long lasting memories for our guests and friends, new and old alike. Check out our Events Calendar and also Gift Certificate offers. Please Contact Us if we can answer any questions regarding Luna Blu. Please note that we are Closed during the Hours of 2:30pm - 5:00pm Monday-Friday. For Reservations please call 410-267-9950 410-267-9950. We look forward to seeing you soon! Lococo's Cucina Rustica serves Santa Rosa, CA with gourmet Italian food in an exciting environment at a reasonable price. Family owned and operated, we pride ourself on excellent service, large portions with authentic mouth-watering Italian food at reasonable prices.